Till the time I was in college, never saw Dad purchasing radish, beetroot, Onion, Cauliflower, cabbage and carrots from the market. Even before taking his morning tea he used to go to our backyard to pick up fresh vegetables from our garden with dew drops on it.....It was a sight which till then we never considered to be GREAT !! It was only after I moved to big city where space was the constrain understood the value of kitchen garden. 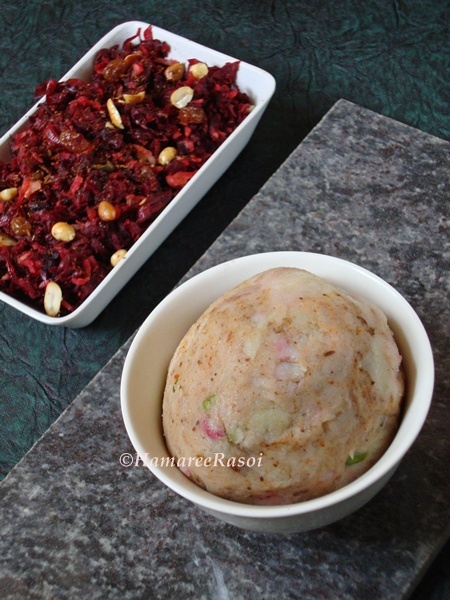 And beetroot was Dad's favorite....He used to come for lunch and not seeing his fav beetroot on salad plate with a little bit Kala namak(rock salt) would made him upset....In winters this beetroot chop was a regular feature during evening snacks at our place. 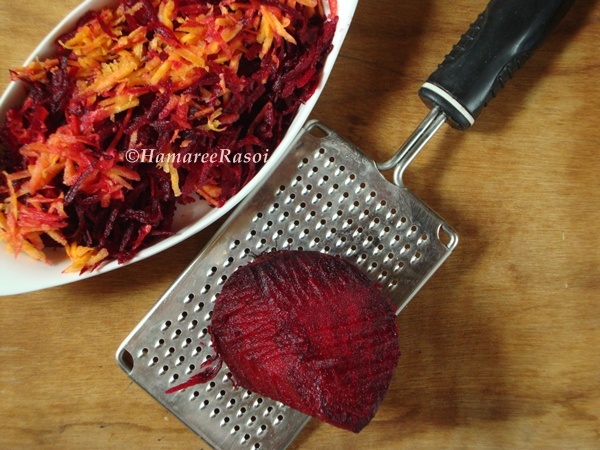 After washing beetroot and carrots properly, peel off their skin and grate both of them. Heat 1tbsp oil, fry the peanuts first and keep it aside then fry green chillies and grated ginger for just few seconds. Immediately add grated carrot and beetroot. Add salt to taste and stir fry on high flame to evaporate the water. This process doesn't take more than 5 minutes. Now add pepper powder, jeera powder, raisins, shredded coconut and mix thoroughly. Fry till the mixture looks soft but not mushy. Remove from heat and spread it on a plate to cool down completely. Peel the skin of potatoes and mash them. Soak a slice of bread and squeeze out the extra water by pressing the bread slice between the palms. 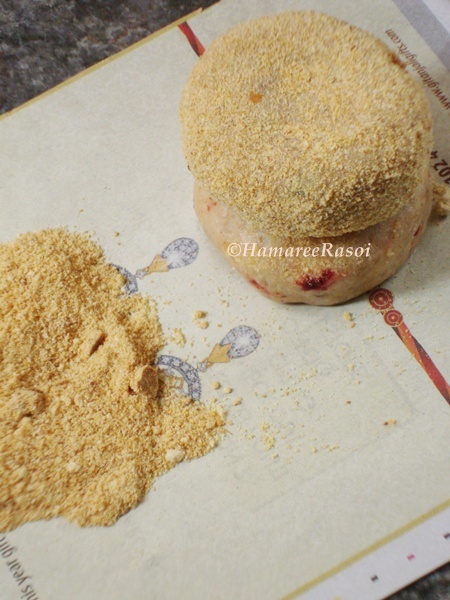 Evenly mix the bread with potato mixture and add all the powders (except breadcrumbs). Mix all the ingredients well until incorporated. Now to make the chops, take a big pinch of potato dough, grease your palm with very little oil and flatten the dough to make round disk. Place 1 tsp of filling in the center and seal the dough into all the sides. Roll these balls on the breadcrumbs to coat evenly. Heat a pan on high heat and then add sufficient oil to fry the chops. When the oil is hot enough, slid 2-3 chops at a time and fry on low to medium flame.Fry the chops from both the sides until golden color. 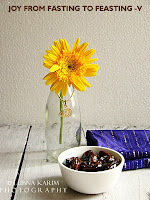 Place them on absorbent paper to soak excess oil. Serve these vegetable chops with Kasundi (mustard sauce) or with ketchup. drooling dear !!! rush your entries for Fast Food Event - Noodles . 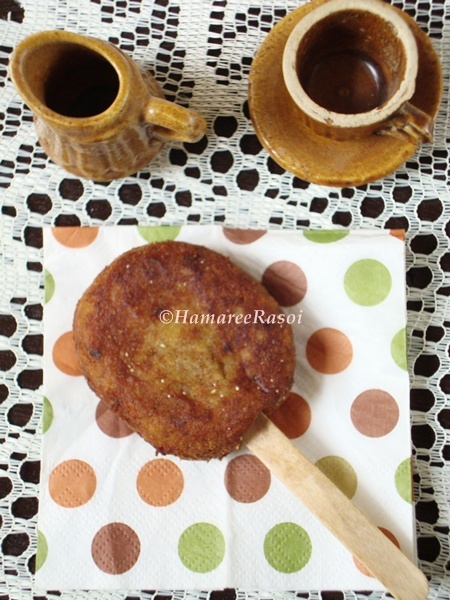 Liked the idea of presenting chops with icecream sticks....looks yumm and tempting. Liked the last click. Good one...am going to try this for my son.. So yummy and very tempting..
Never thought of eating chops with churmuri, delicious looking chops, love beetroot..
Yummy & healthy. Yes Dear, do update the post with event links and logo. 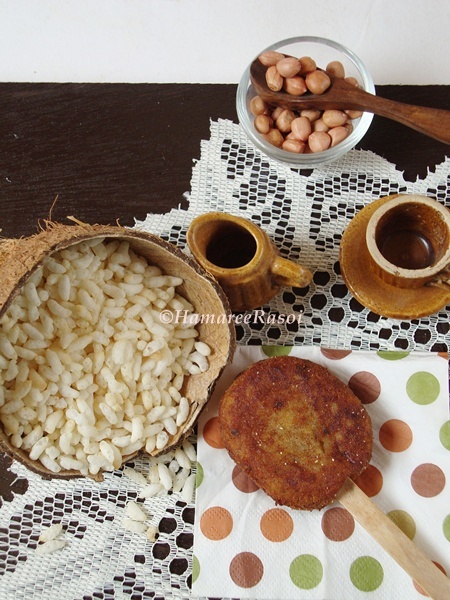 Link the recipe @ Latha's space. Delicious lovely texture and lots of flavor. healthy n delicious snack, looks very inviting!! Awesome & healthy snack,yummy inviting presentation!! That truly looks fabulous and tempting!! YUM! awesome...can't wait to try this. looks delicious and indeed very healthy! Loved it..and bookmarking right away..looks so inviting.. Very yummy and loved the idea to insert a ice stick :) Looks cute and sounds healthy! Looks amazing..Darun recipe ta ! 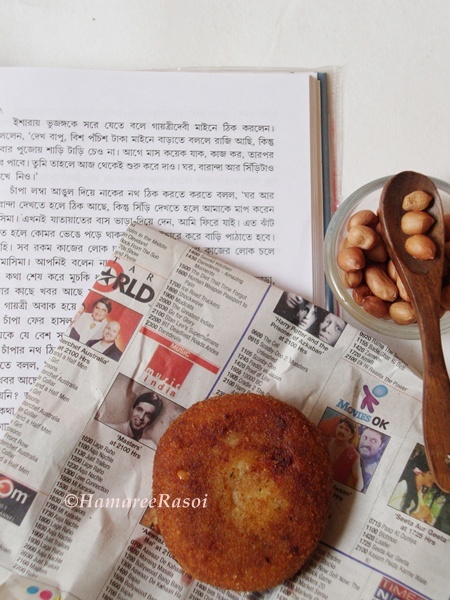 Bhegetable Chap darun hoyeche :) Hope my bengali is not that bad. Luv the idea of using the ice cream stick. 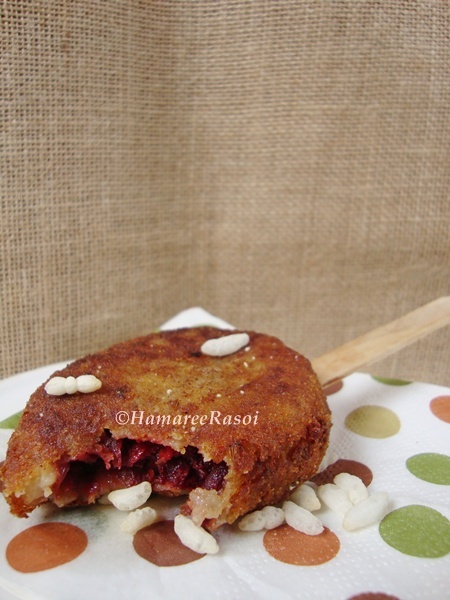 Beet chops looks delicious and perfect Deepa. You have a wonderful blog here. All of your recipes are interesting and inviting! I love chops and yours look perfectly made. 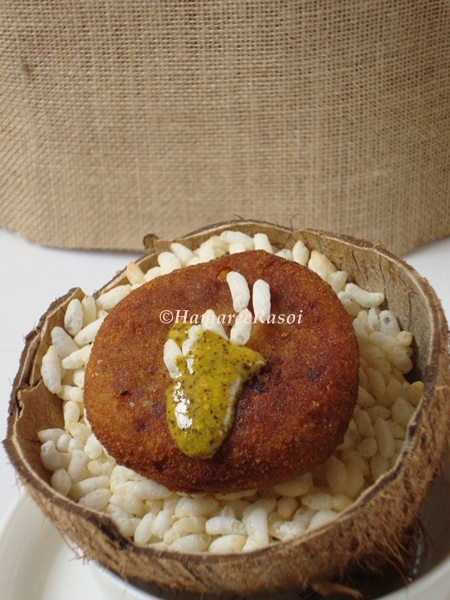 Mouthwatering & irresistible!! I actually wanted to request you for this recipe...!! Trying it out soon!! I have never had anything like this..it looks very delicious. lovely clicks.never had this before..lokks yumm. Delectable and yummy :) Sounds healthy too :)And Happy Independence day dear!! Never know this dish before. Chop looks fabulous dear. Happy Independence day! Thanks a lot Deepa for sending this wonderful and healthy chops to my event. I'm sure kids will love this colorful treat. an interesting way to enjoy beetroot..